Welcome to our complete guide on farming Sinister Cloth in Monster Hunter World as quickly as possible. Sinister Cloth is a critical crafting item in Monster Hunter World, that you're going to need plenty of if you want to upgrade your existing weapons and armor items to higher levels. In this Monster Hunter World Sinister Cloth guide, we'll be detailing how to farm Sinister Cloth in Monster Hunter World, which you're going to need plenty of if you want to upgrade your items. If you need anything else on Monster Hunter World, including how to successfully track down monsters using the Scout Flies, as well as how to capture monsters without fail using Shock Traps and Tranq Bombs, head over to our Monster Hunter World guides walkthrough hub. Unlike basically every other item in Monster Hunter World, you can’t actually find Sinister Cloth by yourself. You’re unable to carve it from the corpses of deceased monsters, and you also can’t find it out in any environment, including elite endgame areas like Elder’s Recess. The only way to acquire the Sinister Cloth for certain in MHW is to use the Tailrider Safari to your advantage, a feature which is buried away in Astera. Head into your personal quarters in Astera. Speak to your feline Housekeeper. Select the 'Tailrider Safari' option. Select a Palico, either one of your friends' Palico or a random one. Select a region of the Monster Hunter World to send the Palico out into. From this menu, you’ll have to select someone’s Palico, and select a region to send them out into. This can be any region in Monster Hunter World, from the starting area of the Ancient Forest, all the way to the Coral Highlands and the Elder’s Recess. You’ll now be presented with three routes for each region, and each route will have Gathering, Research, and Hunting tasks, each rated on a five star system. The higher rating the area has, the more difficult it’ll be for your Palico to obtain any rewards from them. Although Sinister Cloth is known to drop through Palicoes venturing out into the wilds in the Tailrider Safari missions, it’s admittedly an incredibly rare drop. 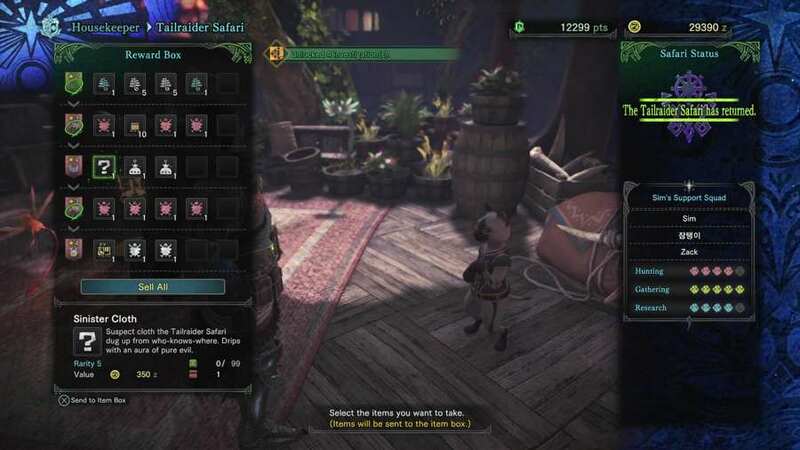 Players have reported that sending a Palico out on a high level Hunting mission does appear to increase your chances of obtaining a Sinister Cloth, in particular when facing off against a Great Jagras or a Barroth. But what can you actually use the Sinister Cloth for in Monster Hunter World? 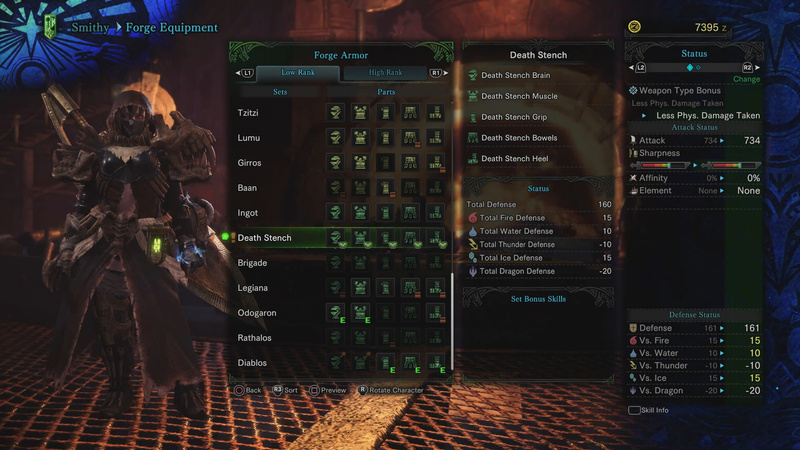 You’ll need a total of five Sinister Cloth items in order to craft the complete Death Stench armor set, available in the High Rank armor section of the Smithy in the Workshop of Astera. The Death Stench armor set looks like something straight out of the Gothic horror game Bloodborne, and it boasts solid defense statistics against both fire and water damage, as well as a decent overall defense rating of 160. This might conclude our Monster Hunter World Sinister Cloth guide, but continue ahead to our complete weapons guide, or our full guide on the best armor in the game.